Use your hands to bring all the ingredients together until well combined. Divide the mixture roughly and using your hands, shape the mixture into meatballs only small ones. Heat the sunflower oil in a large frying pan and fry the meatballs, do this in batches if needed, for about 5-8 minutes until golden all over. Meanwhile, pour the beef stock into a large saucepan and bring to a gentle simmer. 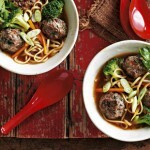 Add the remaining chilli, the noodles, carrots, broccoli and meatballs to the broth. Bring the broth to the boil and simmer for 4 minutes until the noodles and vegetables have softened and the meatballs are cooked through.